I assume your horse respects your space; that on the ground he stands a couple of feet away, relaxed and cool. He doesn’t shove his way through gates ahead of you, or jerk the lead rope out of your hands, or perform police-like body searches looking for hidden surprises. Please tell me I’m right. Because it reflects your consistency with small corrections, as well as his general level of confidence. Consistency is the best kindness we can show a horse. When he knows what’s expected and gets rewarded, there are fewer mood swings, less anxiety, and a more positive overall ride. For both of you. Horse behavior runs in tendencies. If every time you transition to a walk, he falls on his forehand and sashays along, dragging his toes, then every transition back to the trot will have fight and drag–you’ll need to over-cue him and he’ll get tense. A tendency of resistance is born. Better to give him a release from work with the reins, but continue the good forward rhythm, building a consistent positive tendency of balance and energy. The willingness to go forward is one of the biggest issues we nag about and if we have just inadvertently asked him to dawdle, it’s our fault. Our brain (seat) quit riding and he took the cue. As he loses forward it impacts his balance so he might counter bend or even think about grazing. It happens in a heartbeat; he pulls his head and then we wake up and pull it back. It feels like he has a head issue when the real problem was the instant before that when his rhythm broke. The correction for losing forward is more leg but we’ve pulled the reins. Now the horse is more resistant yet and we cued the whole face fight from the beginning. And the truth: Horses like small cues and we humans instinctively over-use our hands. When he slowed down, instead of cuing his body, we corrected his face. We’re not even on the same page–it’s as if you asked for a drink and were given a book. What if the truth is that he isn’t disobedient, but instead he takes every cue given, even the ones we aren’t even aware we’re giving? A horse’s response time is seven times faster than ours. It’s totally possible. Assuming you’re a normal human, who naturally thinks with her hands instead of her seat, now he’s stuck on your tight rein and you’re kicking hard enough to bruise your horse’s ribs, so he’s bracing his flank. He thinks you cued that too. It’s still a partnership, but now the tendency is running backward. Throw down your reins and let him walk. Any speed, just walk. Feel your sit-bones flow with his back. Remember how good that feels? And your legs follow the swing of his barrel back and forth. Rhythm that is broken by the reins is restored with the seat. While that relaxed forward walk is simmering along, think about the other space that your horse isn’t respecting–the space between your knees. Back when he first lost forward, in the split second just before his head moved, his shoulders changed. Maybe one collapsed or shifted to the outside, but either way, it was a leg correction that was needed. Now do a couple of transitions and when you feel him fall off the rail or make an unplanned turn, feel his movement through your knees and legs. Ignore his head, be disarmed. Just feel him with your body. Teach yourself to recognize when leg is needed. Notice how much your hands want to take the bait and begin to re-train yourself. If you are moving straight and he throws a shoulder through your leg, that correction needed is made with the displaced leg. Ask him to stand tall again. Putting awareness in that cuing leg might be enough. But just like ground work, you might have to bump him to respect your space…between your legs. As you prepare to turn, maybe he’s stiff and you feel the universal urge to pull the inside rein. Let that nasty rein urge be a cue to YOU to use more leg. Again, feel him between your knees. Think of your legs as a tunnel your horse is going through: if it’s a straight tunnel, he moves straight, respecting your legs. If it’s a curve, then turn your waist and feel your inside knee open as your outside knee closes. Trust him to curve. Let your hands and shoulders follow your waist turn in unity, but keep focus on cuing with your seat and legs. If your waist is turning, your body is supple and that’s the cue you want to give–to be supple. If there is a second he resists that, our first instinct is to ask harder with our hands. I repeat, this instinct to use our hands is almost irresistible, but leave your hands still. If he needs more energy from you to take the cue, give it with your legs and seat. It’s the very definition of counter-intuitive, but if you can feel him resist that outside knee, that same knee is the aid you answer with. Ask him to stay between your legs by correcting his shoulder with your leg, not a louder rein. Leave both your faces out of it. Too often, when our brain reacts, our hands escalate the conversation too quickly: a bit is still metal on bone. 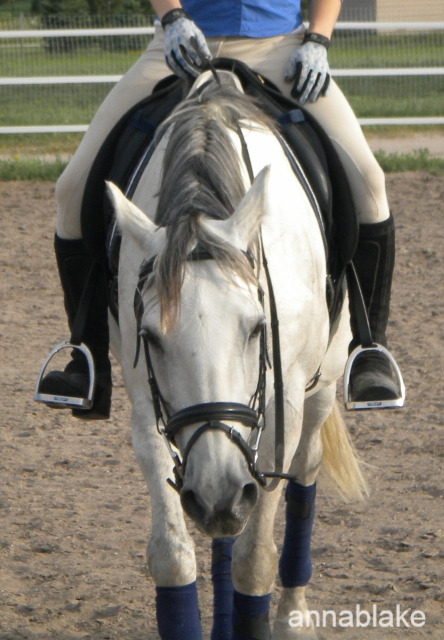 In dressage, we ride an invisible interior line from your inside foot to your outside rein. It’s a supple, fluid cue that is given body to body. It creates a connection that is literally more than skin deep, oneness is the reward. Don’t let your hands cheapen it. Ride consistently aware in the saddle; feel his conversation with you and respect him enough to ask for his best answer. It’s the true definition of positive training. This is exactly what I needed to read today! We’ve been working on our connection on the flat, and sometimes I need the reminder that more hands is not the answer. When I can remember that, we have more connected, fun rides together. Thank you for this. It does get easier, in a decade or two. 😉 Thanks. What good timing.. This week I was having issues with my horse bracing against the bit when I asked for a trot to walk transition. I decided I’d try just asking with my seat and we had the best trot/walk transitions ever. It seems like I have to relearn this epiphany every other week. Ugh. It’s fighting instinct for us… so it always returns. Good job of listening to your horse, he’s the best reminder. So good, makes perfect rational AND intuitive sense, and it SHOULD be so easy to do, if we didn’t have to unlearn almost everything! Exactly, Christine. We always talk about horse instincts, but rarely human ones. We are born grabbing for things… it is so natural to humans to use our hands first. Very hard ‘instinct’ to break.